How do the brain and body work together to generate adaptive behavior, i.e., behavior that allows animals to survive and reproduce? 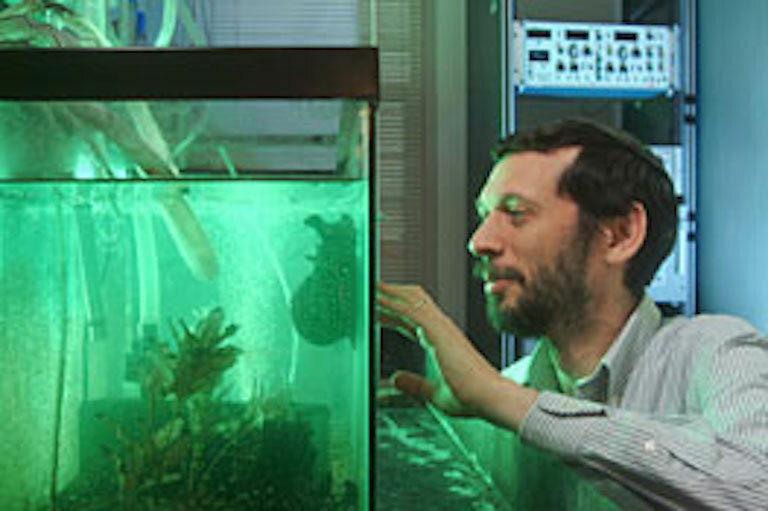 Our laboratory addresses this question through the use of multiple approaches, including neurophysiology, modeling, computer simulation, and novel techniques for characterizing the biomechanics and neural control of the feeding apparatus of the marine mollusk, Aplysia californica. We have used magnetic resonance imaging to visualize movements of the feeding musculature in intact, behaving animals, and computer simulation to create three-dimensional models of the musculature. We have extended these studies through the creation of models of the feeding apparatus that incorporate forces and neural control, and have tested the predictions of these models through in vitro and in vivo experiments. Another way in which we have tested hypothesis about the function of the mechanical system is by constructing biologically-inspired robots. At the same time, we have begun to develop novel techniques for wirelessly recording and stimulating neurons in intact, behaving animals. These studies are providing insights into the biological principles that underlie adaptive behavior, and into the design of biologically-inspired artificial devices that will have the flexibility of animals. Jenkins, M.W., Duke,A.R., Gu,S., Doughman,Y.,Chiel,H.J., Fujioka,H., Watanabe,M., Jansen,E.D., and Rollins,A.M. (2010) Optical pacing of the embryonic heart. Nature Photonics, 4:623-626, doi:10.1038/nphoton.2010.166. Chiel,H.J., Ting,L.H., Ekeberg,O., Hartmann,M.J.Z. (2009). The Brain in its Body: Motor Control and Sensing in a Biomechanical Context. Journal of Neuroscience 29:12807-12814. Lu,H., Chestek,C.A., Shaw,K.M., and Chiel,H.J. (2008) Selective extracellular stimulation of individual neurons in ganglia. Journal of Neural Engineering. 5:287 – 309. Neustadter,D.M., Herman,R.L., Drushel,R.F., Chestek,D.W., and Chiel,H.J. (2007) The kinematics of multifunctionality: Comparisons of biting and swallowing in Aplysia californica. Journal of Experimental Biology 210:238 – 260. Phattanasri,P., Chiel,H.,J., and Beer,R.D. (2007)The dynamics of associative learning in evolved model circuits. Adaptive Behavior. 15(4):337 – 396. Ye,H., Morton,D.W., and Chiel,H.J. (2006)Neuromechanics of multifunctionality during rejection in Aplysia californica. Journal of Neuroscience 26: 10743 – 10755. Novakovic,V.A., Sutton,G.P., Neustadter,D.M., Beer,R.D., and Chiel,H.J. (2006) Mechanical reconfiguration mediates swallowing and rejection in Aplysia californica. Journal of Comparative Physiology – A. 192: 857 – 870. Chestek,C.A., Samsukha,P., Tabib-Azar,M., Harrison,R.R., Chiel,H.J. and Garverick, S.L. (2006) Microcontroller-based wireless recording unit for neurodynamic studies in saltwater, IEEE Sensors Journal. 6: 1105 – 1114. Ye.H., Morton,D.W., and Chiel,H.J. (2006)Neuromechanics of coordination during swallowing in Aplysia californica. Journal of Neuroscience 26:1470-1485.